The four principal pilots are pictured here with the HL-10 on Rogers dry lake bed. In this historical photo from the U.S. space agency, the four principal HL-10 pilots are seen here with the lifting body aircraft in January of 1969. 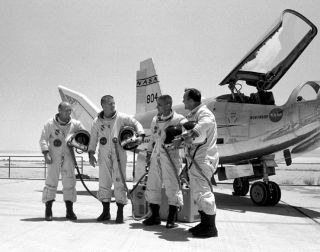 They are, left to right; Air Force Major Jerauld R. Gentry, Air Force test pilot Peter Hoag, and NASA pilots John A. Manke and Bill Dana. The HL-10 was one of five lifting body designs flown at NASA's Dryden Flight Research Center, Edwards, California, from July 1966 to November 1975 to study and validate the concept of safely maneuvering and landing a low lift-over-drag vehicle designed for reentry from space.